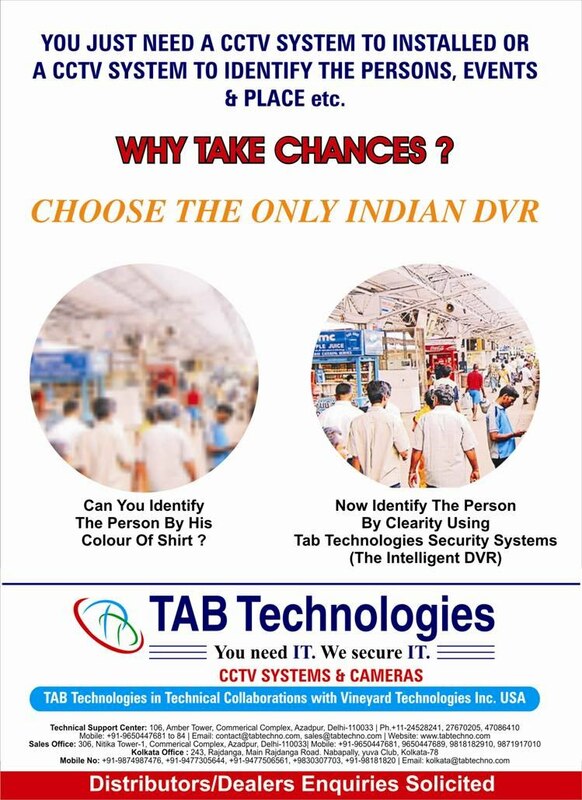 TAB Technologies is the only manufacturer of DVRs in INDIA (Made in India CCTV Systems). We have our Technical Collaboration with Vineyard Technologies, Inc. USA. Hence we have highest technology of Stand-alone DVRs in the world. We started world's First DVR in Hindi and we were also the first to introduce SATA & SATA-II Interfaces world-wide in DVRs. We are always producing all DVRs with Full D1 (720 X 576 Pixels) Resolution in Live Monitoring, Recording as well as Playback. All other DVRs show pictures in D1 when monitoring Live but records in CIF (360 X 288 Pixels) i.e. 1/4 of the D1 Resolution. when As all the other DVRs available in market are with CIF (360 X 288 Pixels) recording resulting unclear picture in the playback. But due to Full D1 feature our DVRs records the same quality as camera can provide us, but other DVRs reorders only one fourth of the camera quality and the objects with other DVRs are not clear in playback. Above all we are providing Telephonic and Internet based support for life-time for all our products. We provide Life-Time Free Telephonic and Internet Based Support to Distributors, Dealers and all our Customers for all our DVRs. Services and System Integration at customer sites is the duty of system Integrators (Dealers & Distributors). All Configurations are done as per requirements as per requirement of customers and best performance of the DVR. After warranty, Repair of the DVR is provided without any service Charges. Need to pay for parts only. ON Site Services are also available on payment basis from nearest point of service. The Only "MADE IN INDIA" DVR. We Provide High Definition & Full D1 Resolution (720 X 576 Pixels) in Live Monitoring, Recording and also in Playback. Others are providing D1 only in Live Monitoring and in recording and playback others offer CIF Resolution (360 X 288 Pixels) i.e. 1/4 of our resolution. First to Introduce DVRs with Hindi Interface. Also working on other Regional Indian Languages. Certified ActiveX Components to monitor the DVR location safely without loosing security of your computer Systems, all other DVRs require to loose the security of your computer systems, if you want to monitor the DVR on your system through LAN or WAN. We are the only Indian Manufacture of Digital Video Recorders in Technical Collaboration with Vineyard Technology, Inc., USA. We Provide all our DVRs to work with best performance in Indian Scenario as we understand the Indian Users, Systems, Internet Bandwidth and also the other factors of India. Our DVR Resolution makes our DVRs useful because all other DVRs record approx 1/4 of the resolution of the live camera. In some of the DVRs D1 resolution is also provided, but they reduce the frame rate to provide the D1 resolution and the other DVRs become only 25 FPS DVR (6 Fps X3- Channels and 7 FPS X1-Channel = 25 Fps) for all channels resulting in breaking picture and can not capture the fast movements. We provide High Definition & D1 Recording and Playback at 25 FPS X 4 -channels i.e. our DVR is capable for 4 Times more processing per Channel and for handling the same we use 16 times heavy processor for our DVRs. In Other DVRs anyone can never identify the objects clearly as the Video is recorded in low resolution in small size in lower pixels.